We invite you to join us at 10:45am this coming Sunday December 2nd when our Minister Sally Sago will be leading our first service for Advent. Adults, children and young people are all welcome. We are opposite W H Smith in the King Street pedestrianised area of Thetford, postcode IP24 2AP. During our current sermon series ‘Joseph: The BIG Picture Guy’ we are posting questions to help you think about the scripture passage. For Week 9 on November 18th we looked at Genesis 47:1-12 on Respect. (Recordings of the sermon will be available in the foyer of the church). 1. Think about who Joseph showed respect to and why in this passage of scripture. What helps you to have respect for someone? What causes you to lose respect for someone? Who do you consider you have respect for? 2. How much courage does it take to go to someone who has power or position or control over some part of your life and speak to them or ask them for something? Why do we sometimes feel intimidated? Why do many of us struggle with authority? 3. Jacob, Joseph and his brothers all lived with uncertainty about their circumstances all their lives. Even now they have only come to live in Egypt for a while (Verse 4). How does the story of Joseph and his family help us and teach us to live with uncertainty, with growing older, and with change? 4. In verse 9 Jacob describes himself as a pilgrim. With what do you associate being a pilgrim? Have you ever considered yourself to be a pilgrim? 5. Read and consider Hebrews 11:13-17. 6. Micah 6:8 How do you consider you walk justly in your life? What issues of Justice are there that we should address as a church family? 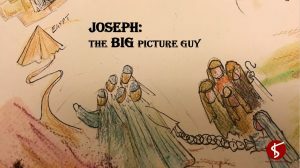 We invite you to join us at 10:45am this coming Sunday November 18th when our Minister Sally Sago will be continuing our series on ‘Joseph: The Big Picture Guy’. This is week 9 out of 10 and is entitled ‘Respect’. The service will include celebration of communion. Adults, children and young people are all welcome. We are opposite W H Smith in the King Street pedestrianised area of Thetford, postcode IP24 2AP. 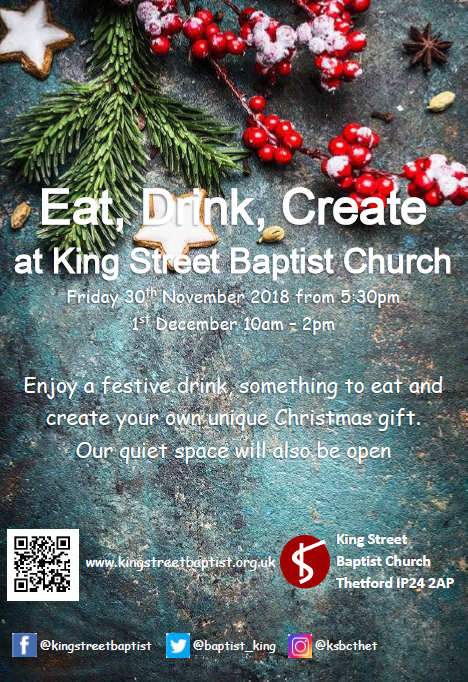 To coincide with Thetford’s Christmas Lights switch-on we are holding Eat, Drink, Create at King Street Baptist Church from 5:30pm on switch-on night November 30th, and again the following day December 1st from 10am – 2pm. Pop inside to enjoy a festive bite to eat and a drink, and optionally create your own unique Christmas gift. As last year, you can also visit our quiet space if you wish, for you to take a break from the hustle and bustle of the Christmas period and spend a moment in quiet reflection. Now and again we hope to be carol singing outside too! During our current sermon series ‘Joseph: The BIG Picture Guy’ we are posting questions to help you think about the scripture passage. For Week 8 on Remembrance Sunday November 11th we looked at Genesis 45 on Reconciliation and Forgiveness. (Recordings of the sermon will be available in the foyer of the church). What does it mean to live out the lines of the Lord’s prayer? ‘And forgive us our trespasses, as we forgive those who trespass against us’. ‘Forgive us our sins as we forgive those who sin against us’. What makes it hard? What human characteristics get in the way? 2. Read Ephesians 1:3-10. Discuss in the light of our themes of revelation, forgiveness, reconciliation and God’s big picture and his plans for each of us. 3. Consider 1 John 1:5-10 which places forgiveness at the heart of our Christian faith. What do verses 8 & 10 say to you? Are you able to be light in the darkness? b) In your work place? 4. Consider the Triangle picture on this post, as used in Sunday’s sermon. (If you are in a group it may be useful to follow the bullet points in twos). UP is your relationship with God – your worship time, devotions, prayer, bible reading, 1 to 1 with God. IN is your relationship with those in the family of church and other Christians, the time spent walking with others, receiving and giving, growing in your own Christian journey but also helping and encouraging others. Being a disciple and being discipled. It is intentional and regular. OUT is your opportunity to share what you have received from your UP and IN with those who do not know Jesus. Not necessarily bringing them to church but sharing friendship, hospitality, acts of kindness, peace. 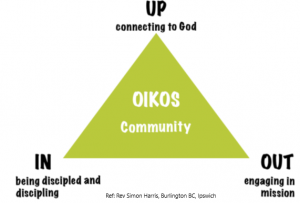 Oikos is the Greek name for household it meant the church community that met in each other’s homes in the New Testament. • Score yourself out of 10 as to how you think you are doing in each aspect of life at the moment in each area. • Are you in or out of balance – it is an equilateral triangle. • Share your scores with someone else and discuss where you can make small changes. • Pray together about being in balance. This coming Sunday November 11th King Street Baptist Church is holding its annual Remembrance Sunday service, as we commemorate 100 years since the end of the First World War. 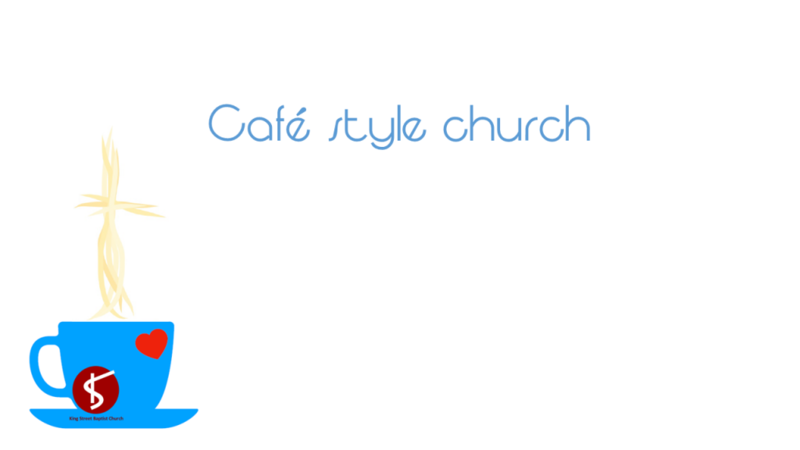 Join us at 10:45am. We will be linking up live with the Cenotaph in London at 11am for the two minutes silence. Local artist Kevin Moore will be displaying and introducing various artworks relating to Remembrance. Our Minister Sally Sally will be preaching from Genesis 45 on reconciliation and forgiveness in our series Joseph: the Big Picture Guy. Adults, children and young people all welcome, refreshments served after the service. 1. In this passage we see many insights into a family that has lived with deceit at its heart for many years. 2. There was a famine in the land. People were hungry. What pictures, thoughts and feelings do you see and feel when you consider the impact of famine? What action can we take today to help those in famine torn countries? If you are able to look online – search to find more information about famine in 2018 and discuss with others if you are part of a group. Spend time in prayer for these countries and discuss actions that will help. 3. In verse 8 the brothers come before Joseph but do not recognise him. They do not see because they do not expect to see Joseph. How often do we not see what is before us? 4. The tables are turned in this passage as Joseph has power and authority over his elder brothers. They are accused of being spies and held hostage in prison. Only then do they suddenly realise how Joseph must have felt when he was thrown into the cistern and sold even though he was not guilty of a crime. What was the result of this do you think? What emotions do they experience during this episode? Who can you think of who was falsely accused or imprisoned either in reality or fictional characters? What does Jesus’ reaction to being falsely accused, arrested, imprisoned and crucified have to teach us? We invite you to join us at 10:45am this coming Sunday November 4th when our own Liz Pearce will be bringing us the message, continuing our series on ‘Joseph: The Big Picture Guy’. This week is called ‘Reap what you sow’. Our Minister Sally Sago will be leading the music, and adults, children and young people are all welcome. Hope you can join us!